On September 26, 1580, Sir Francis Drake sailed into Plymouth Harbor, England, becoming the first British man to sail around the world. 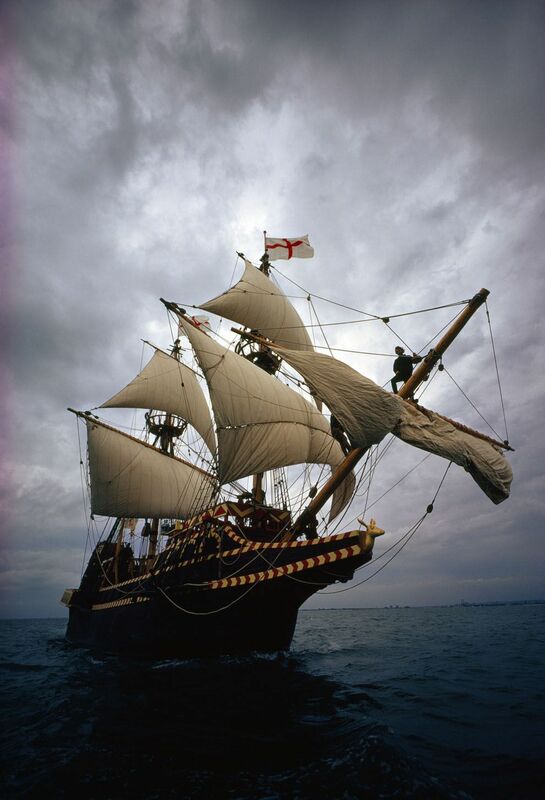 This ship is a reproduction of the Golden Hind, the galleon in which Sir Francis Drake circumnavigated the globe. On September 26, 1580, Sir Francis Drake sailed into Plymouth Harbor, England, becoming the first British man to sail around the world. Drake started his journey in England in 1577 with five ships, but by the time he rounded the tip of South America, only one was left, the Golden Hind. In addition to exploration, Drake used his voyage to antagonize the ships and settlements of Spain. The Spanish were taken by surprise and not prepared to defend themselves. Drake returned to England in 1580 with a ship full of gold, silver, gems, and other treasures.